Basically, this Manchurian fried rice is a Chinese dish. We can try to make it into the Indian version. This Manchurian fried rice contains some veggies such as carrot, cabbage, capsicum. Which have so many nutrients in it. 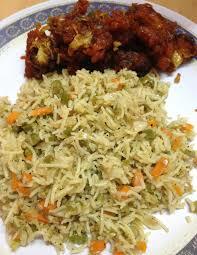 This Manchurian fried rice contains some veggies such as carrot, cabbage, capsicum. Which have so many nutrients in it. Coriander leaves 1/2 bunch, finely chopped. 1. Cook the rice only 90 keep it and keep it aside. 2. Take a bowl. Put some veggies in it, and keep aside some veggies for making gravy. soya sauce, and salt. Here you must have to take care while putting salt in it because in soya sauce there is salt present. 4. Now put all together this and make small balls of it. 5. Now you have to fry these balls. 6. Take aside these fried balls and now take a pan, put it on high flame. 7. Pour oil in it. 8. Now put remained veggies into the pan.stir it nicely for 2 to 3 minutes. 9. Then put green chili, black pepper powder, soya Sauce, very little salt in it. 10. Now Put some water in it. 11. Then put all Manchurian balls which we made in it. 12. Just cook it for 5 minutes and then put the cooked rice in it. 13. Again cook it for 5 minutes by keeping lead on it. 14. Lastly sprinkle coriander on it and serve it hot.